Today, March 6, the United States Mint released its newest annual product for collectors, the 2018 Proof Set. The collectible holds ten coins in clad composition with each showcasing frosted designs against mirror-like backgrounds. U.S. Mint image of its 2018 Proof Set. Coins of the set are encased in two protective lenses that shipped together in one illustrated carton along with a certificate of authenticity. This set will rank among the U.S. Mint’s most popular products of the year with sales likely to reach around 600,000. Around 200,000 of them should sell in the next few days alone. They are presented together in two protective lenses that ship in an illustrated cardboard sleeve along with a certificate of authenticity. 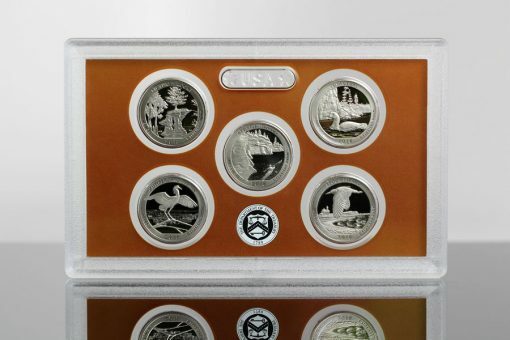 Six of the coins have one-year-only designs, including the quarter-dollars that are issued as part of the U.S. Mint’s ongoing America the Beautiful Quarters® Program. The program features five different designs annually with each honoring a unique site of national interest. CoinNews photo of a lens holding this year’s five quarters. 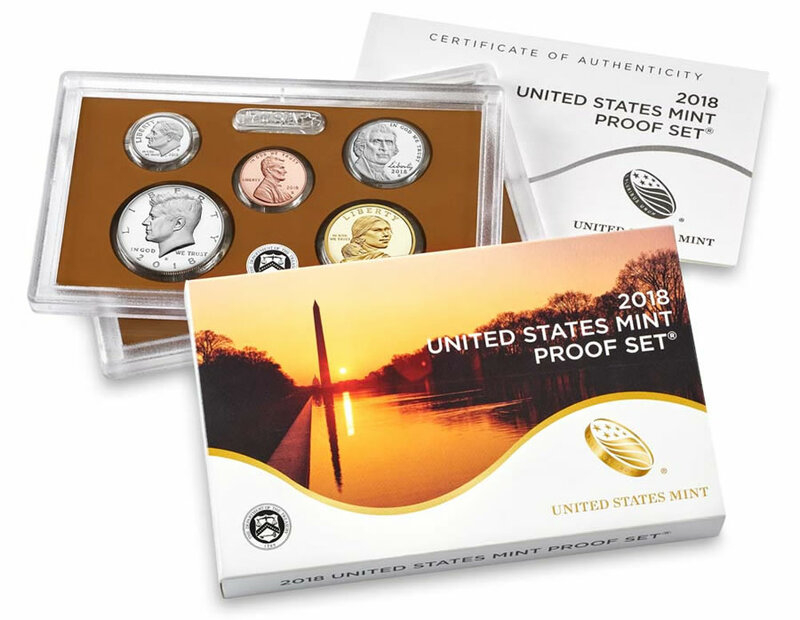 The proof quarters are also available separately as part of the 2018 America the Beautiful Quarters Proof Set. The U.S. Mint released this set on Jan. 23 for $14.95. Honoring sports legend Jim Thorpe, the Native America dollar is the other coin with a unique design for 2018. Buy the set straight from the U.S. Mint’s online store, located here, or by calling toll-free at 1-800-USA-MINT (872-6468). Love the color of the coins and how they are positioned. would hang on my wall as art. These modern clad U.S. Mint Proof sets are beautiful for sure, but future value is obviously very low due to high mintages. Most “modern” clad Proof sets from 1968 (when they started making them all at the San Francisco Mint) to just a few years ago can be purchased now for below or near issue price. Serious collectors are not the only ones buying all of these sets each year, but also the non-collector parents & grandparents who got on the Mint’s mailing list in the 1960s & 70s when the hobby was at its height & purchase these cheap clad sets as annual gifts for the kids & grandkids as a habit. That is the main reason so many are purchased each year. High-quality, beautiful clad Proof coins in a pretty package with COA with not much value. Many thanks to you both for such a truly delightful cornucopia of extremely enlightening (and helpfully educational) observations regarding the many varieties of rationales, purposes and ends for purchasing the annually-issued U.S. Mint clad proof sets. What I gleaned, and quite gratefully at that to be sure, above all from both of your contributions to this seemingly complex issue is that – as is apparently so often the case with matters numismatic (and quite possibly universal) – after all the relevant monetary and practicality considerations have been dealt with in a sufficiently concrete, logical and realistic manner, it is instead left to one’s personal inclinations, tastes, preferences, wishes and desires to march to the fore and establish themselves as the ultimate determining factors of one’s decision. Mike – well said. Anything that makes us happy is money well spent. Absolutely, as someone once said, “Buy what you like but like what you buy” – kinda sounds like a Yogi Berra-ism. Or as in the old days the very prominently-posted sign in the Enlisted Personnel Mess Hall proclaimed, “Take all you want but eat all you take.” Amen.